CASPER'S LARGEST STORAGE SERVICE WITH OVER 800 UNITS IN 4 LOCATIONS. Trust K & L Storage with your personal possessions in our secured self-storage locations. We provide gate code access and security monitored facilities with over 800 units in Casper, Wyoming. We also offer U-Haul trucks and trailers for moving across town or across the country. Appliance dolly rentals and packing supplies are available in our office for your convenience. PROTECTION AND SAFETY OF YOUR BELONGINGS IS OUR PROMISE. Commercial and business storage is perfect for storing extra inventory, documents, files, furniture, and merchandise. We work to accommodate any business for their specific needs. We have specialized unit sizes with easy access at any location. We have extra large units for service trucks, work space storage, and allow for package delivery for business units. 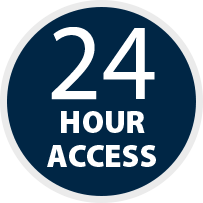 We offer 24/7 access to business accounts unless otherwise specified. Automatic billing and invoicing are available. YOU CAN RESERVE A UNIT RIGHT NOW. We understand that time matters. When you need to get into a unit right away we have you covered. You can reserve your unit online, get your access code, and move things in when the time is right. This process makes things much easier for you. Book a unit now online!